This has become one of the hottest tickets in our calendar year and it’s full on festive fun all the way! Delicious treats await you upon arrival as we open our special Christmas Market showcasing edible gifts, cooking gadgets and Angela’s Cookery Books which make perfect stocking fillers and treats for friends and family. Inside the kitchen we welcome you with sweet treats and hot drinks. Then sit back and relax as the culinary extravaganza begins! 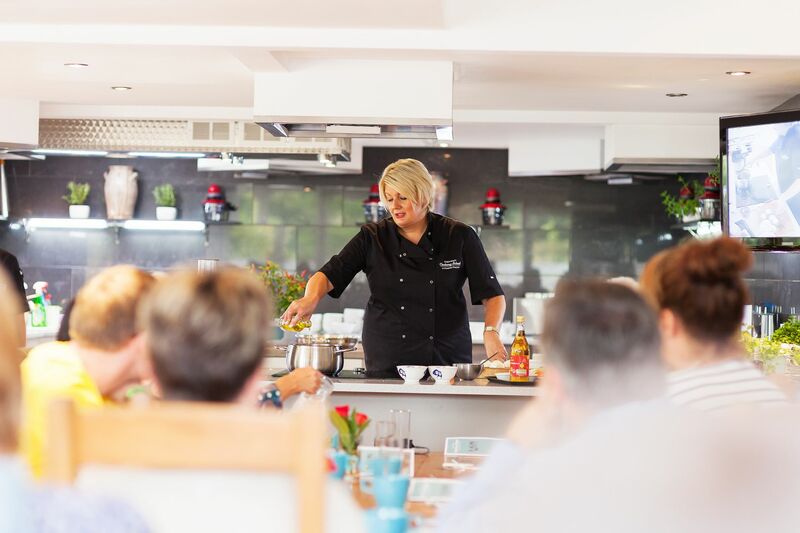 Angela will be demonstrating some of her favourite celebratory dishes, including a stunning Three-Bird Ballotine (de-boned, stuffed and trussed) and an eye-popping Festive Snowball Cake complete with a Christmas Liberty ornament, plus lots more! We will be serving you tasters during the event to keep your taste-buds happy and we will also have bubbly and wines for sale throughout. The event will end with the infamous festive raffle, featuring all the dishes that have been demonstrated. Lunch is available at Llanerch Vineyard after Saturday Morning Kitchen. To book a table, please call the Vineyard directly on 01443 222716. Please make sure your booking is from 1.15pm onward.